​WHY DO PEOPLE GET CROWNS? As stated above, the main reason you might get a crown is to repair a damaged tooth, but there are additional benefits of crowns. Many people choose to get crowns simply to cover a tooth that is discolored, while others may get a crown to improve a bite. An improper bite can sometimes cause teeth to shift, and crowns serve a dual purpose of strengthening a tooth as well as improving alignment. Depending upon the issues facing your mouth, some types of crowns may be more preferable than others. 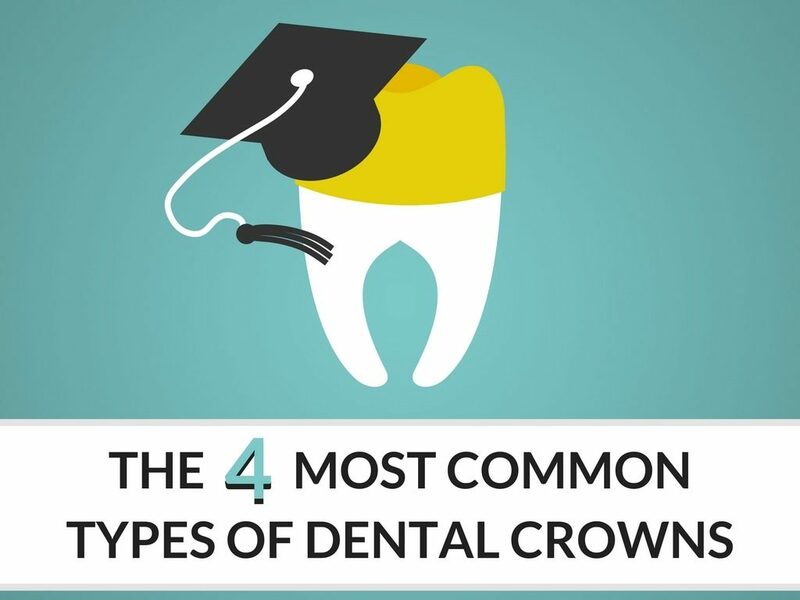 Knowing the differences between the various types of crowns and the materials they are made of, along with guidance from your dentist, will help you gain a better understanding of why one particular crown may serve you better than another. Have you ever heard of Cubic Zirconia (aka fake diamonds)? This strong material has been used to make hip replacements since 1985 and entered dentistry shortly after the year 2000. If you’re wondering how tough this type of crown is, there are numerous YouTube videos of lab technicians pounding these crowns into a 2×4 without the crown breaking. With zirconia, you can preserve the tooth structure and retain its strength just as you can with all metal crowns. Most patients prefer this type of crown as they are tooth colored and better for patients that may have gum inflammation or metal allergies from other types of crowns used. The E-Max crown is considered a breakthrough in dental crown technology, as it’s another metal-free option. Patients with E-Max crowns are getting a glass ceramic crown that is tough, built-to-last and delicate in appearance. This is a type of all-ceramic crown with an appealing translucent color which is combined with extra strength and durability. ​The E-Max crown is a great option for damaged, stained or poor quality teeth. This is an all-ceramic crown with a realistic translucent color. It’s combined strength and durability come from the materials this crown is fabricated with. An E-Max crown is made from a single block of lithium disilcate ceramic, a top grade heavy-duty material. Metals that can be used to make a crown include gold, nickel, chromium alloy and palladium. Sometimes crowns made with metal are easier to fit onto a tooth, as less of the tooth needs to removed in order to make a secure fit. A combination of both metal and porcelain materials provides both durability and a more aesthetically pleasing appearance, as the porcelain can be matched to the color of your teeth for a discreet application. While these materials offer you the best option for disguising the crown as part of your real teeth, they may not be as durable as other materials over a long period of time. Usually used for front teeth, these crowns are also an ideal choice for those who have metal allergies. What about stainless steel crowns? Stainless steel crowns are typically only used on children, and usually only primary teeth, as the crown will come out when the tooth does. A stainless steel crown might also be used as protection for a tooth in the time it takes to make a crown from another material. If you think you may need a crown, please speak with your dentist more about the procedure and the preparation that must be conducted before a crown can be made and properly fitted. The best quality of crowns today are still those that are lab produced. While you’re waiting for a crown, your dentist should outfit you with a temporary crown. Be sure to ask your dentist about the quality of same-day crown procedures if they are producing them in-house.